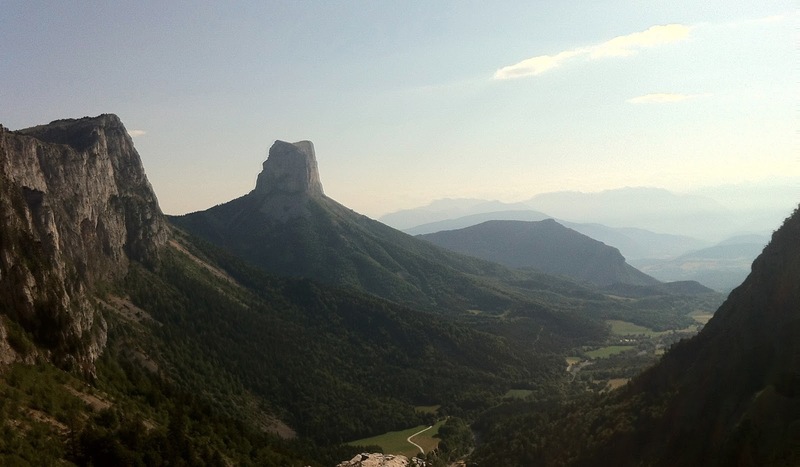 I got a taste of the Vercors on my trip along the E4 in 2011 but felt that I might be missing the best parts. The E4 took me along the western side of the plateau and although I experienced some of the huge characteristic limestone cliffs and gorges it was the ridge on the eastern side that looked really special. The escarpment, particularly when viewed from the north from the Chartreuse, looked like a frozen wave magically captured at the point of breaking. Well I’ve now been back, walked my own “Vercors Circular” and can confirm that this is an amazing place. Geologically part of the sub-alpine Jura, the Vercors is separated from the Chartreuse, a sister range to the north, by the Isere Valley. It’s generally described as a plateau but the reality feels more complicated. Huge cliffs form the north, east and western boundaries but there are valleys on top of the “plateau” running north / south and gorges which slice into it from east to west. Across the valley to the east you have the Alps proper and to the west the Rhone valley and beyond that the Massif Central. 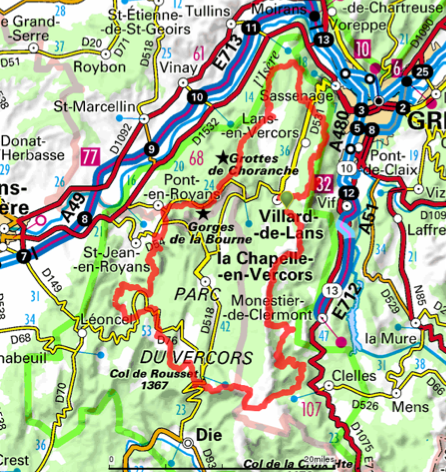 Grenoble sits, hemmed in, in the gap between the Chartreuse and the Vercors. From the cliffs on the eastern side of the Vercors you look right down into the city. The contrast between the two places could hardly be more immediate. Walking with Christine I wanted to do a circular trip around around the Vercors which included the ridge that forms the eastern boundary. The initial plan was to see how far we could get in six days but at the last minute were able to extend this to eight walking days and became a lot more ambitious. We based most of the itinerary on the Grand Traverse du Vercors (GTV) circular, which goes around the whole massif. You need a bit longer than eight days to do the whole 300 kilometres but we managed a 200 kilometre mini-version, starting and finishing at St-Nizier-du-Mocherotte, chopping three or four days of the GTV itinerary in the south and west. Go to the link if you want to download the GPS trail. We stayed in small hotels all booked in advance. Travelling in the last week of July it was harder to find accommodation than I had anticipated, places were full, and this stretched the itinerary a bit. Some of the days were too long and if it wasn’t quite so busy I would have taken a more direct and less demanding route. I was walking 10 hours a day last year on the E4 but it’s a lot harder to do that straight off the plane from London. In the last week of July the French holiday season is in full flood and it’s impressive to observe it close up. The French have 10 “national parks”, managed by central government, and 45 “regional natural parks” designated nationally but managed by regional government. 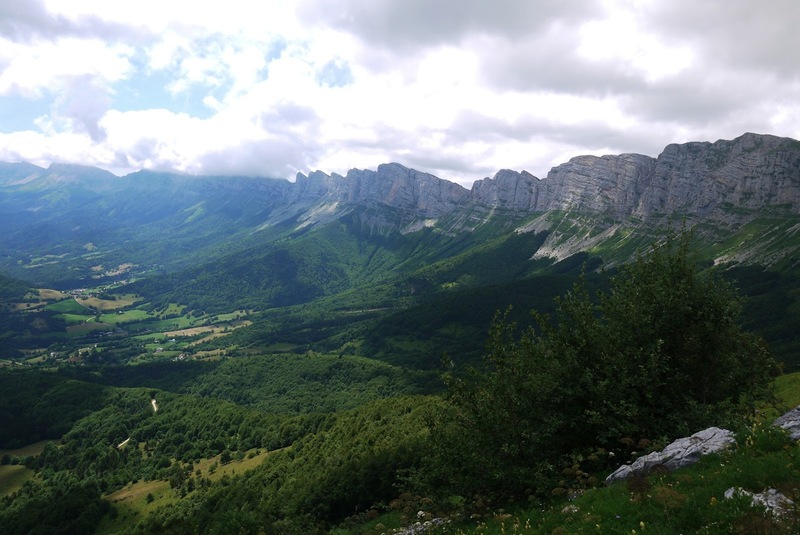 The Vercors is a regional natural park and set up to encourage outdoor activity all the year round. There were lots of walkers, including large numbers of multi-generational groups; walkers with donkeys to carry their gear (particularly popular with families with small children); pony trekking groups; and of course cyclists. The trails themselves are excellent, very little road walking and often along old agricultural routes and nicely graded. Waymarking was also good although given the density of footpaths you do have to watch out you don’t miss a turn and head off down one of the numerous and often equally attractive variations. While most trails are reasonably easy there are some tough bits. In particular you can’t avoid going up and down the sides of the enormous gorges and occasionally these are very steep and demand a good head for heights. Despite the fact that some of the hotels I had intended to book were full we found excellent and interesting places to stay. One of joys of place to place walking is never quite knowing what your accommodation is going to be like at each day’s end, and on this count the trip didn’t disappoint. Having completed my own Vercors circular I can confirm that the route taken by the E4 does not do the area justice. It would be much better to travel via Chatillon-en-Diois along the GR 91 through the heart of the Vercors or take the fabulous eastern leg of the GTV. Either route would take you above the tree line and expose you to the amazing eastern ridge. I suspect the GTV route is better, certainly more convenient, and the day we spent walking either side of the ridge, from Vallard-de-Lans to Gresse-en-Vercors was definitely one of the day’s walking I’ve had. If I was going to do the a circular Vercors again I would probably save the eastern ridge for the last few days as it is just so spectacular. Fantastic when a plan comes together and today’s nearly did...it was slightly flawed perfection. The bus, which I had found about in the UK, really existed, took us effortlessly up to top of the cliffs which tower thousands of feet above Grenoble, cliffs I had walked down after an impossibly long day last year on my E4 walk, and dropped us right in the middle of St Nizier du Moucherotte and close to the start of the walk. The walk was also exactly where it was supposed to be although, ominously, longer than anticipated. The only flaw was the location of the hotel, the Hotel Taiga, which was well to the south of Villard-de-Vans, not the thing you want after a long day. We started the walk at about 11, and were in Villard-de-Vans at about 6.30pm. We had stayed overnight in Grenoble and perhaps, with hind-sight, we should have caught the earlier 9 o’clock bus to the top. It was a tough first day's walk, about 1,200 metres of climb, involving a 600 metre climb up to Moucherotte and another 600 metre climb later on up Pic St Michel. Apart from a little bit of road walking at the bottom of the ski lifts at La Sierre the route went along an off-road trail along dry limestone uplands. We were a bit unlucky with the weather on top of le Moucherotte, low cloud completely obscured the view, but things got better as the day went on. We stopped off for a break at the mountain restaurant at les Allieres and then climbed up to Pic St-Michel. The views were huge, intimidating, a sheer drop of nearly 400 metres and views along the cliff to le Moucherotte, the top of which was still covered in cloud. The cliffs really are sheer and if you had the nerve you could sit with feet dangling over the side and watch the hustle and bustle of Grenoble which fills the floor of the valley far below. It was fairly cold and windy at the top and we didn't hang about but crashed our way down to Villard-de-Lans, a much bigger town than I had expected. Couldn't remember why I had chosen the particular hotel, a Tripadvisor review I expect, but the address wasn't on the town map near tourist information. Christine got directions from a man in a shop but after wandering increasingly aimlessly into the countryside we started to loose confidence. For once I had the hotel phone number and the really helpful owner was happy to come and pick us up. Staying in town would have an option but La Taiga is excellent value with good local food, and the owner really knows his walks. Over dinner he suggested a change to our plan next day and offered to give us to the start of the walk. An amazing day, definitely a top 10 walks- of- all-time candidate. The original plan was to follow the route of the GTV which goes eastwards and crosses the ridge at Col Verte and then tracks south contouring two or three hundred metres below the top of the huge scarp all the way to Gresse-en-Vercors. This makes for a very long day but the only en-route accommodation was booked up (although we could have stayed in the dormitory at Refuge la Soldanelle). The owner at Hotel La Taiga persuaded us that contour walking virtually all day would be boring and suggested crossing the ridge further to the south at the Pas de l'Oeille. Happy to take local advice particularly when it came with a lift to the starting point. The first stage, the climb up to pass, was wonderful. The route took us firstly through hay meadows, then climbed through a wooded dry valley, then a tough climb up zig-zagging across scree, before finishing finally with a lovely gentle ascent across an upland meadow full of wildflowers. A runner was using the 600 metre climb to up the pass as part of her biathlon training programme - very impressive - although most of the other walkers were ascending or descending at a more leisurely pace. The views from the top of the pass were excellent. The Alps on the other side of the valley were poking up above the clouds which we still hanging around the top of la Grande Moucherolle which towered above us. The second stage, and the first of a number of scheduled ridge crossings, involved a very steep descent down to the main GTV route: a steep treacherous path definitely requiring a head for heights. 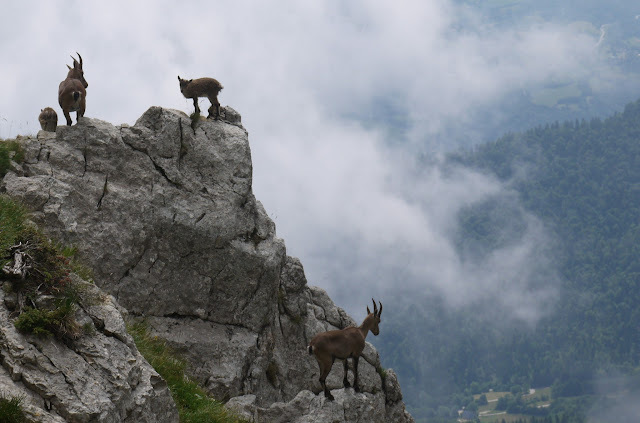 We went down carefully and I'm not sure if our trip was helped or hindered by a family of chamois, very close and photogenic but prone to dislodging rocks in an alarming way as you passed underneath. The third and final stage was the contour walk from underneath la Grande Moucherolle all the round to the point at which you turn off for Gresse-en-Vercors. An amazing stretch of walking above the tree line and right under towering cliffs, huge views forward with impressive flat topped outlier of Mont Aiguille in the distance to the south. I guess the only problem was that I had underestimated the length of walk and with all the ups and downs and ins and outs round various gullies it was much longer that my 28 km estimate. We had walked almost non-stop for 10 hours by the time we got to Hotel le Chalet at Gresse-en-Vercors. Christine’s confidence in my route planning, never high, has taken a serious battering. Although I didn’t quite know where the Hotel le Chalet was as we approached the town (again not inspiring confidence) it turned out to be in an excellent place, right next to the church in the centre of town. It was also very good with definite foodie pretensions. As usual the navigational stresses and strains disappeared once we had secured our destination, had a shower and drank our first glass of wine. Not as epic as yesterday’s walk but another good one although again just a bit tougher than we had expected. It was shorter than the previous day so we compensated by starting later and didn’t really get going until after 10. 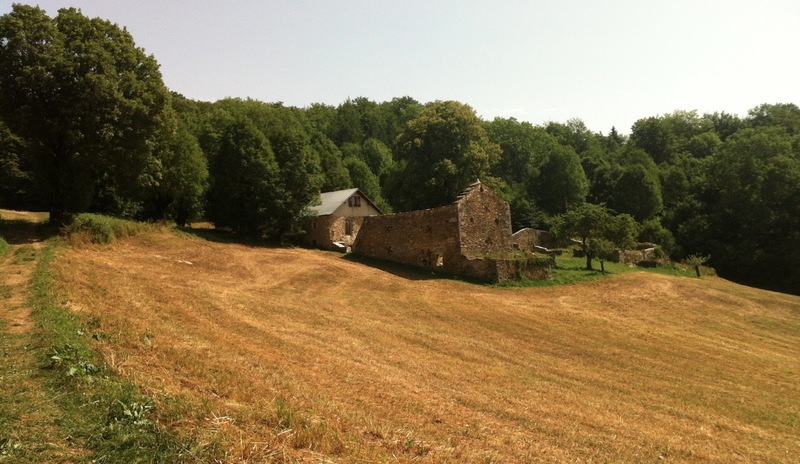 We finished by 4-30 after for a lovely simple farm auberge lunch in La Batie. Perhaps a reaction to yesterday’s huge walk but today felt longer than 6 hours. There were two significant highlights. 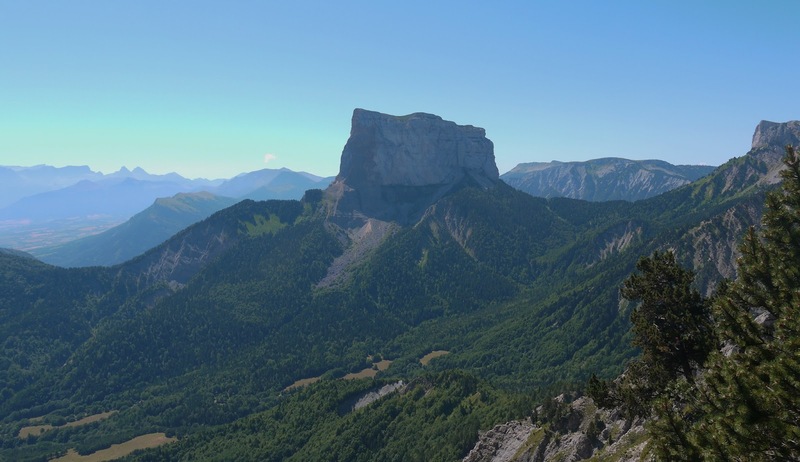 The first was the huge cliff at le Grand Veymont, which at 2341 metres is the highest mountain in the Vercors. The second involved walking three parts of the way around Mont Aiguille, a table top mountain that has escaped from the main Vercors massif and which seems changes its shape every time you look at it. Only 23 kilometres today but a couple of climbs and starting late meant that we were walking in the heat of the day. My experience of walking along the E4 is coming back to me - always start early - middle of the day walking is knackering. We didn’t actually go into Chichilianne - our hotel, the Au Gai Soleil du Mont Aiguille - was a couple of kilometres to the west of town and happily in the right direction for crossing the pass tomorrow. The food was a bit disappointing but the manager was really helpful and helped find some taxi numbers for tomorrow’s trip. Christine is refusing to walk another step unless she knows that we have an escape option. One the accommodation options which fell through was at Col de Rousset (where there is a very small hotel) so instead we are walking another 15 kilometres or so making it 34 kilometers to Font d’Urle which, with a couple of passes to go over, and making 34 kilometres may just be too far. The fall back option was to stop at Col de Rousset and get a taxi....a contingency that in the end we didn’t need to execute. Turned out to be another great walk, Christine who had her doubts at the start of the day, finished it by saying it was one her all time favourites. After yesterday we managed to get away nice and early and were on the trail before 8am climbing up to the Pas Aiguille. Much easier than we had expected and the climb was rewarded with lovely early morning views back down to valley. The pass is a scene of one of the battles with the resistance in July 1944 when German/Austrian mountain troops crushed a resistance uprising timed to support the Allied landings at Normandy. The Vercors area is an important site for the resistance and yesterday at the hotel we saw old men, who we speculated were veterans as they had copies of 1944 newspapers, who seemed to be in the area to commemorate the anniversary of the battle. Although we had made time to the top of the pass I wanted to take the opportunity of a short cut across a dog leg, and head in a straight line cross country to pick up the GR 93. This was a controversial decision and although it saved a kilometre or so of walking was blamed for every bit of difficulty we encountered for the next hour so. 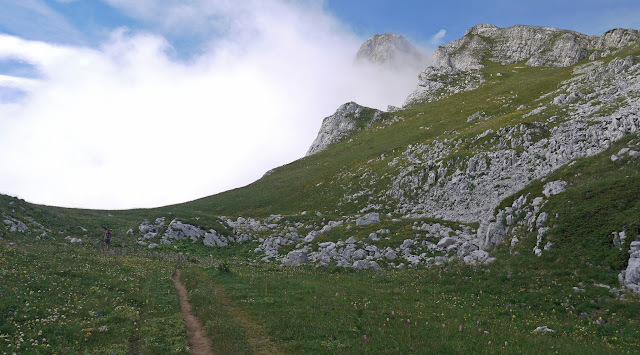 In fact we were crossing a particularly wild and remote part of the Vercors and the walking was tough, with an uneven limestone surface underfoot and a series of small rocky hills and sink holes in our path. It might have been quicker and less tiring to have followed the path, indirect though the route was. On the other side of our wild traverse and back on a main trail we were again on the edge of huge cliffs, this time facing west and south. Lovely easy walking, great views to the “dip side” of the escarpment we had walked beneath on the previous two days and more dramatically into the gorge below to our west. Arrived at the Col de Rousset at about 1 pm, jumped on a chair lift going down and had an ice-cream lunch in one of the cafes in this little ski-resort. The Hotel Rustic where I had originally hoped to stay didn’t look like it was open. Steady climb up again in the afternoon and into one of the upland valleys which run north-south across the Vercors. Completely different sort of country-side - open, farmed and almost arable. Back onto the GTV we climbed up through trees onto a ridge and the fuel provided by the lunch-time ice cream was soon exhausted. Suddenly we are on a wild wide open upland limestone plateau, and the scenery lit by the early evening summer sun makes this the best part of the day and enough to keep us going. Got to Font d’Urle and the Hotel Dryads at about 6.45 - really nice classic, cheap, family run French hotel that also offers stabling for horses and donkeys. Excellent day. Has originally hoped to stay at the Hotel at Col de Machine but it was full and instead we headed to Bouvant-le-Bas and the Hotel Sapin. The GTV heads south and west from Font d’Urle, and goes on a big loop via Leoncel before heading east again and back to Bouvante-le-Haut. Because we only had eight days we took a more direct route. To be honest the walking was dull compared to yesterday, mainly through trees and often along cross country ski routes. The main consolation was that the shade provided a bit of protection from the sun - today was very hot. The plan was to stop for lunch in Bouvante-le-Haut but the hotel had shut down. Heading out of town on the GTV (on the wrong route!) we found a farm advertising food and Christine knocked on the door. The state of the farm suggested that we were the first customers in a long time and after the farmer overcame his initial shock, brushed away the cobwebs from the table and assembled an old dusty sunshade, he disappeared into the farmhouse to knock up some food. The meal was a real highlight; four courses and a carafe of chilled rosé - all put together almost as fast as we could eat it. Lovely food, the only downside were the flies who for some reason decided they wanted to attack my ankles. Helped by directions from the farmer we headed back down to the Lac de Bouvante (a reservoir) and climbed the 300 metre hill blocking our route to Bouvante-le-Bas; after such a good lunch and in the heat this was hard work. I stayed at Le Sapin at Bouvante-le-Bas last year and to be honest was surprised to find it still in business. Quite a large hotel, run by a mature couple, and who seemed to be struggling to keep the place maintained. Well it was still there, in a similar state, but with a lot more customers than last year (11 instead of 1). Dinner was good although almost identical to lunch (but thankfully no flies). Day 6 Bouvant-en-Bas to Pont-en-Royans. Today we rejoined the GTV at the top of the pass and we now follow it for the rest of the trip. Last year I went from Bouvant-en-Bas to Pont-en-Royans on the E4 and the E4 follows the GR9 rather than the GTV and the GTV, although slightly longer, was a much better route. The GR9 involves 3 kilometres along a road just after Col du Machine which in today’s heat would have been hideous. The 600 metre climb to the top of the pass, over the Montagne de l’Echarasson and down the other side to St-Laurent-en-Royans, was almost entirely in trees but mostly along wonderful old paths. Incredibly hot weather and walking in the shade, with the prospect of ice-cream at the bottom of the hill the only thing that kept us going. From St Laurent-en-Royans the GTV takes you along the base of the cliffs via Ste-Eulalie-en-Royans to Pont-en-Royans, a real beauty spot which sits at the entrance to the Gorge du Bourne. We stayed at the Hôtel Restaurant Du Musée de l’eau which had air-conditioning - fantastic as the temperature was now in the low forties - good food and surprisingly good value. Too knackered to visit the water museum which was a shame particularly as tickets came free with the hotel room. Walked most of today’s walk last year on the E4 although again the GTV took me on a more interesting and this time more direct route. Big tough walk involving about 9 hours walking, perhaps a bit too long. Left early and in time to enjoy cool morning conditions along the Gorge du Bourne. Huge steep sided gorge, particularly to the north the side which you somehow have to climb up out of once you get past the village of Choranche. It’s a 600 metre climb and despite walking along the same route last year its details had slipped out of my memory. From the bottom of the gorge all you see, above the trees, are sheer cliffs with no sign of a way through and indeed the route takes you up towards the cliff face only to retreat down again almost accepting that the barrier is impenetrable. Eventually it takes you on a more sustained attack through trees and steeply up a scree, heading west for a time, then a up a really tough scramble before finally finding a crack in the cliff face. As soon as you get through the crack you on the top and a few metres further on there are some amazing views across the Vercors from the Belvedere to Ranc. On the way up the top we were overtaken by a man out for a walk with his terrier dog. We stop and talk to him at the view point where he is giving his dog some water. He tells us he walks the route on a circular from St-Laurent-en-Royans once a week - really tough guy and a very tough dog - similar age and similar level of fitness to my Spanish friend Juan Holgado. From the top its a lovely walk down to Rencurel. The GTV takes at more direct and interesting route to the E4/GR9, following old roads left by the charcoal burners and passing through long abandoned settlements. We stop for lunch at the Hotel Marronier which was good despite the slow service. Rencurel would have been a good place to stop if we had had more time but in order to finish the walk tomorrow we need to get to Autrans. This involved a steady climb up the valley, through open meadows and along another ancient trail and over the Pas de Pertusen. The GTV then takes you on a meandering route into town but we somehow missed the obvious shortcut. Stayed in the Hotel de la Poste right in the middle which was very good, particularly the swimming pool. 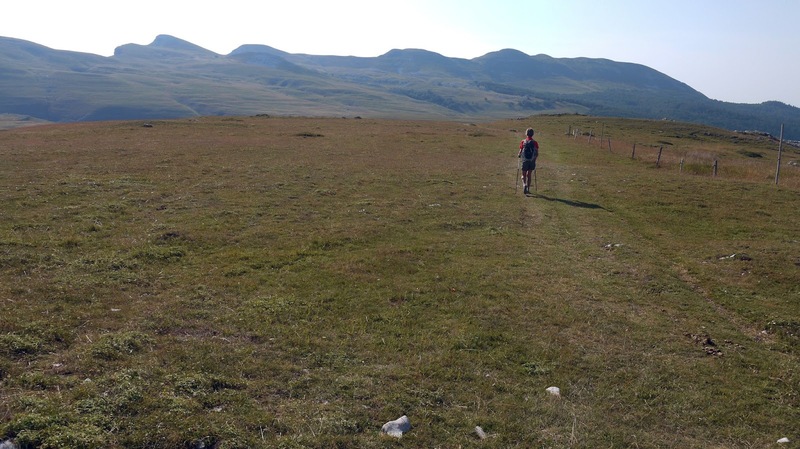 Last year I did an epic walk all the way from la Balme de Rencurel to the centre of Grenoble, 14 hours, but somehow managed to forget just how tough the going was on the this part of the trip. From Autrans you go west returning to ridge crossed the day before and then follow this ridge round in a huge loop from the west side of Autrans to the east. You then drop down a steep gorge into Engins before, theoretically, climbing out of the gorge and finishing the circuit at St-Nizier-du-Moucherotte. There are some spectacular views from the top of the ridge, particularly from the north and north-eastern sides when you’re looking into the Chartreuse but just like last year the views were spoilt by poor weather, weather which actually got worse as the day went on. Once you got onto ridge it was also very slow, constantly climbing and descending over a very difficult rocky limestone path. It seemed to take forever to get from Bec de L’Orient, which marked the point at which the trails heads east, to la Sure, the point at which it heads south, and although going improved we were starting to look for shortcuts. Instead of following the GTV on its long winding route down to Engins we took the more direct route and descended around 600 metres down a well graded path to Engins. Crossing the main road in Engins, getting ready to climb up the side of the gorge on the other side (which I remembered from last year is a tough walk) we spot a bus stop - check the timetable and sure enough in 15 minutes there is a bus to Grenoble. The purist in me, which said complete the circuit, was easily outvoted by the knackered pragmatist and about an hour later we were back in our hotel in Grenoble which we had left a week earlier. John. I have read your writing on the Vercors and also "made" the trip with my imagination and your great photos. July is the month more french walkers use to go out. Well John I presume you are planning another excursion after taking a relaxing few days. Great article! 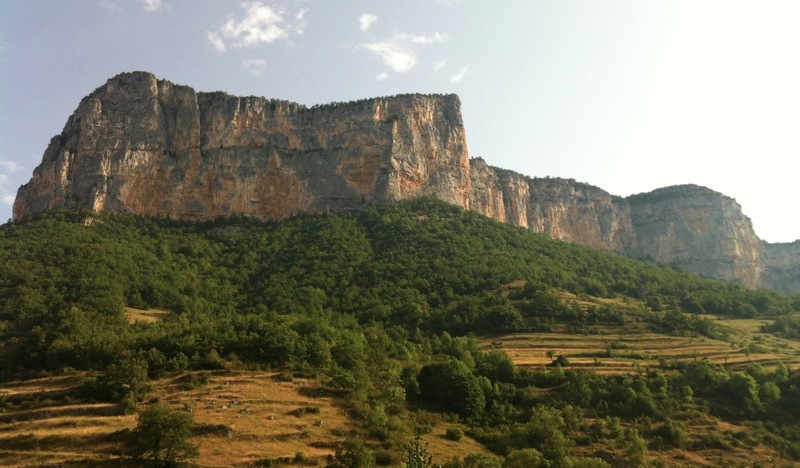 The complete Vercors circular is about 370 kilometers around the Natural Park. A shorter and wilder 60 kilometers variant connects Villard-de-Lans to Chatillon-en-Diois in 3 to 4 days. Hi John - I just wanted to pass along my gratitude for you documenting the Vercors circuit. The GR 91 was my first ever multi-day hike, starting in Rencurel, and it forever changed my life. Reading your post slipped me back into those glorious, long, and sometimes excruciating days. Hope you are still out on the trail somewhere, and if you ever are in the Vercors for more hikes in summer, drop me a line. My wife and I stay in Grenoble every July. Cheers. That's a very nice comment, very warming on a cold grey day in Brighton. The schedule in the blog is very tough, perhaps a little tough for you first multi day trip. After that one the rest will be easy. Great walking in the Vercors, lovely memories. Depending on the most of the snow should have gone by the end of May but it could still be hanging around. It would be too early to walk in the Alps proper. Its all good but I enjoyed the east side the most.